Allegro Medical presents the Beasy Board Glyder Patient Transfer Board System. Anyone faced with the challenge of transferring a family member or patient from a wheelchair will appreciate the benefits of the Beasy Board Glyder Transfer Board. The 32" Beasy Transfer Board Glyder portable transfer system is curved in design to aid in transferring an individual from a wheelchair, particularly when the arm is not removable or the wheel is an obstacle. The Beasy Board Transfer Board system includes two pieces: a Beasy Board Glyder board and a round disc that slides the length of the board, secure within the board's track. The Beasy disc on the transfer board moves in a frictionless manner and rotates 360° making it easy sit, turn and move down the board. The Beasy seat supports the user's weight as the transfer occurs. The friction is borne by the transfer board system, not the user's skin. It is recommended that transfers always occur with a caregiver or attendant present. Because of the special design of the Beasy Transfer Board, no lifting is required, reducing physical strain on the caregiver. Each lightweight Beasy Board Transfer Board system has a 400 lb capacity. These systems have helped many individuals remain at home, continuing treatments, if needed, as an outpatient. Length: BeasyGlyder Beasy Transfer Board 32"
Be sure to check out the model II Beasy Trans Beasy Transfer Board. Please Note: Due to hygienic reasons and sometimes short recovery times, The Beasy Transfer Board is non-returnable. This product works great transferring my quadriplegic husband from bed to wheelchair. It certainly saves some stress on my back. Only one problem. How do you get it under an elderly person before you attempt the transfer? It could work with someone who has upper body strength, is coperative and helps in the transfer process! Evaluating Occupational Therapist suggested this purchase, but actual working therapist thought it just added problems to the transfer. Kept unit to help raise fallen body to a higher level to get into bed or chair. Transfer from wheelchair to car using the transfer board was more complicated even when removing the wheelchair arm. This board is wider at it's widest part by about 4 inches when compared to the traditional wooden transfer board. 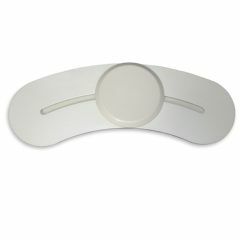 It is harder for someone who has areas that are potential bed sores to get off the beasy board quickly unless your quite strong. can it be use to transfer into a tub and if so how can it be secured in tub?